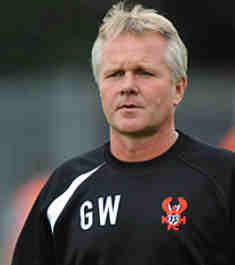 Gary Whild first came to Aggborough in January 2009 as former manager Steve Burrs assistant after working alongside the then Harriers chairman Rod Brown at Redditch Utd as his assistant. He was given the full managerial role there in 2005 and worked with many of the players that he later bought here. Following the dismissal of both Steve Burr and his successor Andy Thorn, in March 2014, Whild became the Harriers manager. Although his record as a coach is exemplary was record as a manager sadly was not and he was removed from the post in September 2015 after failing to win a single league game since March 2015. In a strange sequence of events he was moved upstairs for Tim Flowers to be given the managers job but it appears that neither party had actually agreed to what had been offered and the Harriers board were left looking at their feet shuffling on the ground. Whild is now with Tim Flowers once more as the management duo at Solihull Moors where they helped take them to promotion to the Conference with Mark Yates.